Stained glass can be described as a functional piece of art. It is aesthetically beautiful, yet it serves a purpose. Stained and leaded glass provides privacy, while still allowing natural light to permeate the room. Depending on the design, textures, and colors which make up your stained glass, different levels of privacy can be achieved. In your home, the room where privacy is not a matter of compromise is the bathroom. Stained glass bathroom windows are not uncommon. They are found above tubs and within the showers. They are a wonderful source of natural light, but without any sort of covering, it leaves you completely vulnerable and exposed to neighbors and passersby. In your own home, you should be able to get ready in the mornings and shower with comfort. 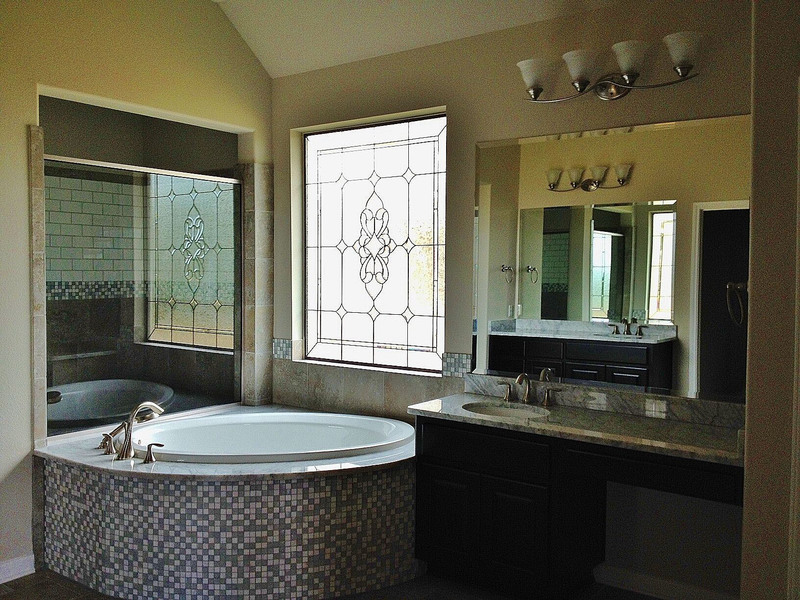 Our homes in San Antonio are sometimes built close together and bathroom stained glass can be both beautiful and functional. 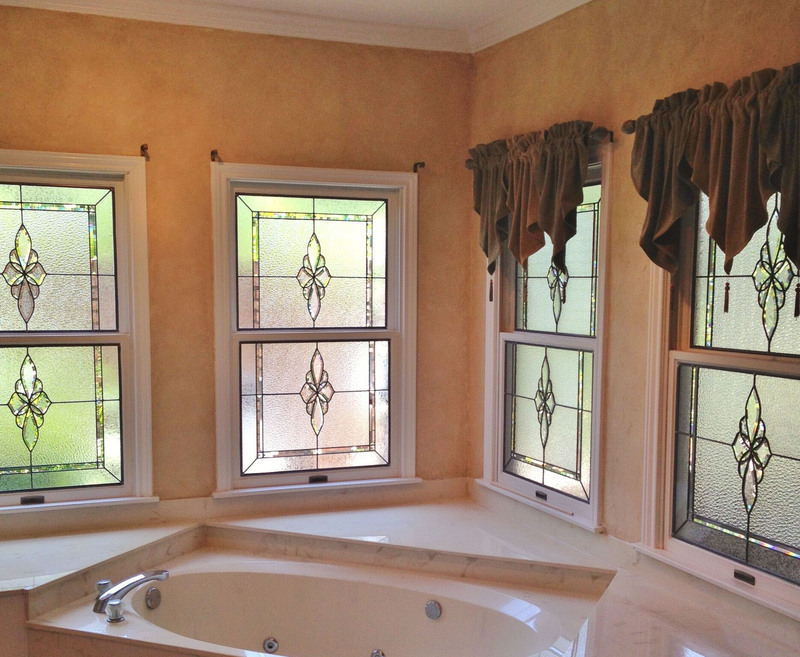 Stained and leaded glass is the perfect solution to your bathroom window dilemmas. 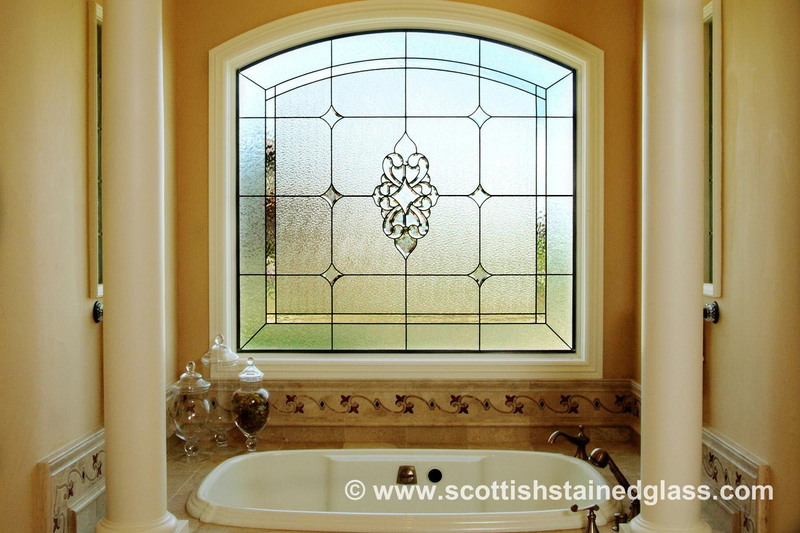 Scottish Stained Glass provides privacy and natural light, eliminating the need to constantly adjust window coverings such as blinds or curtains. You do not need to compromise privacy for sunlight because, with the right design, both can be utilized in your bathroom. Stained glass can be applied to every type of bathroom window, whether it is a picture, double-hung, horizontal sliding, or casement window. We have developed an installation process that allows us to apply stained glass without compromising the window’s ability to open. The leaded glass can be sealed inside the two panes of a double pane window, allowing clearance to maintain freedom of motion. This particular installation process is water-proof and therefore ideal for bathroom stained glass. It protects the stained glass from being constantly exposed to water. In bathrooms, steam and humidity from the shower are unavoidable. 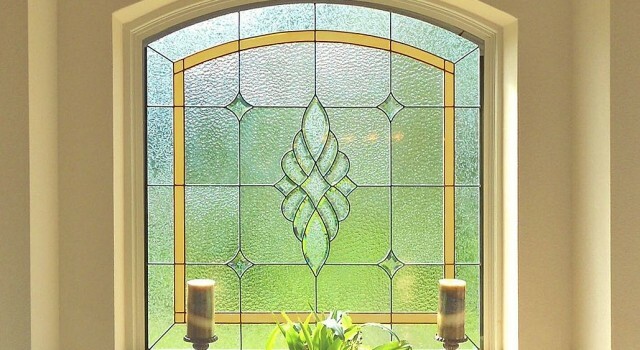 These elements can compromise the integrity of a stained glass window, especially if the window is located directly next to or above the water source. The precipitation can get behind the stained glass and cause moisture build up and even mildew. However, when it is sealed in between two panes of clear glass, it is protected from any possible damage or deterioration. It allows for easier clean up, too. Each stained and leaded glass piece we create is an individual work of art, and we take great pride in the quality of our product. 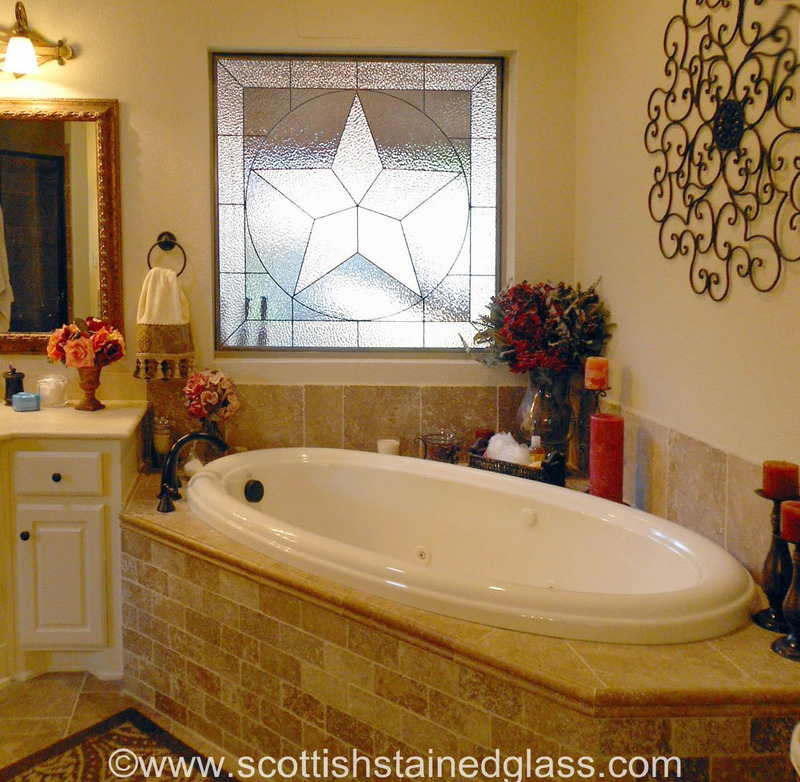 All of our San Antonio stained glass bathroom windows at Scottish Stained Glass are designed per client. This means that they are custom and can be built to any size or shape. No matter if you have an arched, rectangular, square, or circular window; we will collaborate with you to create a design that is unique to your tastes and style preferences. 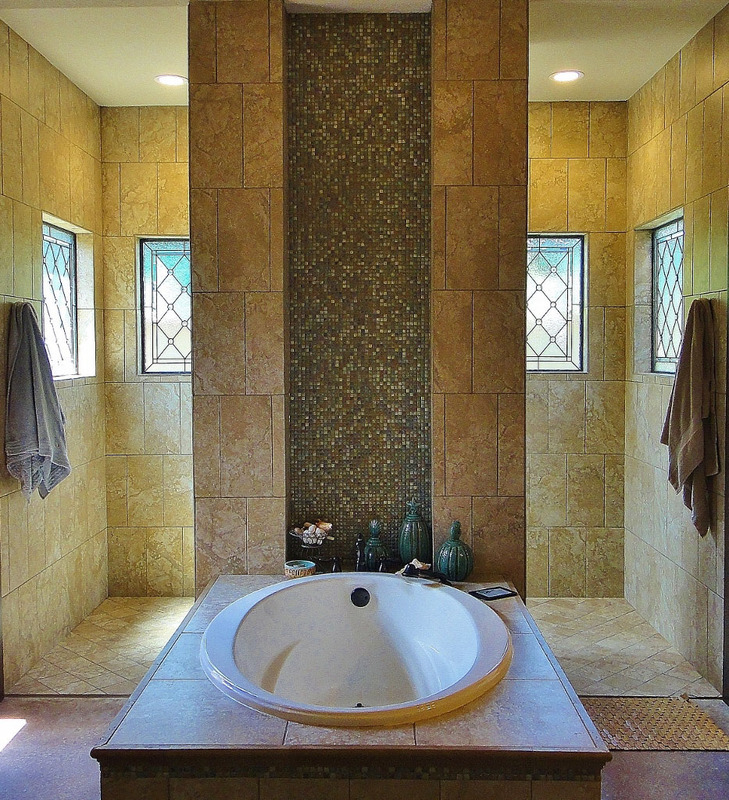 Call or email Stained Glass San Antonio today to discuss the stained glass possibilities which await you and your bathroom. Our knowledgeable and talented staff will assist you in the process, and can set up a free in-home design consultation for you at your convenience.